At night, facial skin deserves a relaxing and restorative rest, letting a tireless molecule work to make sure you wake up with glowing skin. 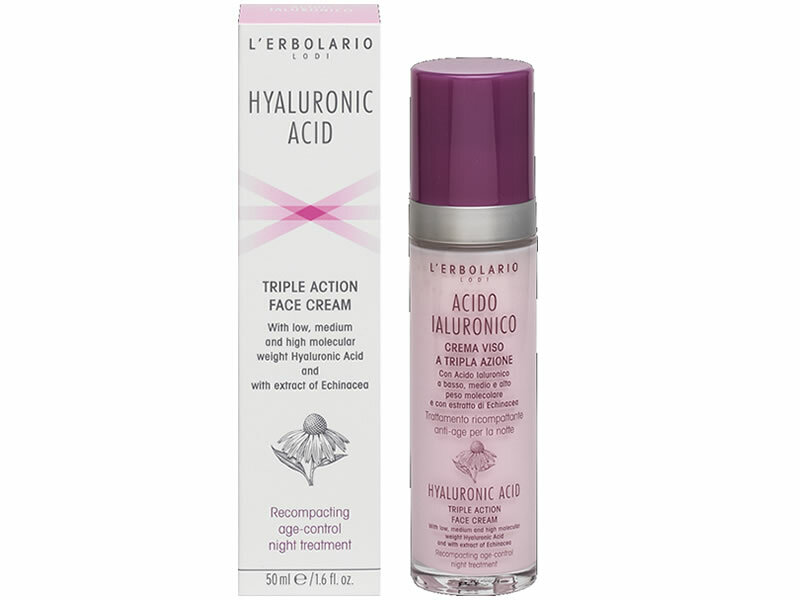 This is Hyaluronic Acid, a cosmetic ingredient with an excellent hydrating effect, involving three levels of the skin, since it acts with low, medium and high molecular weights: it prevents the loss of moisture towards the outside, guarantees the right level of hydration, and promotes the natural production of Collagen, all for the benefit of your skin, which is firmer and less subject to creases and wrinkles. Night-time brings other cosmetic benefits thanks to this anti-ageing treatment, enriched with Extract of Echinacea, which helps stimulate the physiological production of hyaluronic Acid, as well as the presence of Alpine Rhododendron stem Cells, with an anti-dehydrating and highly protective action. Apply to the face and neck with a gentle massage for perfect absorption. Functional substances Low, medium and high molecular weight Hyaluronic Acid, stem Cells from Alpine Rhododendron leaves, dry Extract of Echinacea, Hibiscus Seed Oil, Babassu and organic Sunflower Oil, unsaponifiable Fraction of Olive Oil, Vitamin E from Soybean. Aqua (Water), Helianthus annuus (Sunflower) seed oil, Polyglyceryl-3 rice branate, Coco-caprylate, Coco-caprylate/caprate, Diheptyl succinate, Olea europaea (Olive) oil unsaponifiables, Glycerin, Capryloyl glycerin/sebacic acid copolymer, Orbignya oleifera seed oil, Cetearyl alcohol, Behenyl alcohol, Hibiscus sabdariffa seed oil, Sodium hyaluronate, Rhododendron ferrugineum leaf cell culture extract, Echinacea purpurea extract, Astrocaryum murumuru seed butter, Tocopherol, Brassica campestris (Rapeseed) seed oil, Xanthan gum, Rosmarinus officinalis (Rosemary) leaf extract, Lecithin, Lactic acid, Isomalt, Titanium dioxide, Silica, Citric acid, Parfum (Fragrance), Benzyl alcohol, Dehydroacetic acid, Potassium sorbate, Sodium benzoate.